Once activity on the dock is complete, the boom can then return to it's original locked position to form a safety barrier. This manual boom gate is ideal for industrial applications like warehouses, factories and distribution centres. 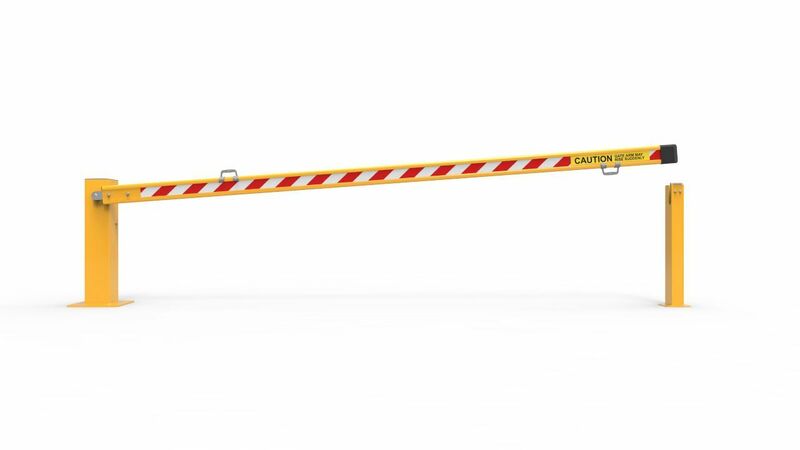 Our Dock-Safe Boom Gates is available in a kits that include gate post, boom and receiver post.. Description: Manual boom gate for open doorways. Operation: Lift with spring assistance. Construcion: Steel posts with aluminium rail. Gate Swing: 90 degrees vertical. Receiver Post: Included (optional wall mount receiver). Rail Type: Aluminium 145 x 40mm. Rail Height: 950mm above floor. Overhead Clearance: Boom length plus 1000mm. Finish: Powder coated with reflective.